Top marketing news, articles and tips from the third week of April 2012.
s relevancy algorithm. And, it’s no secret that Google is making it easier for brands to stay on top by letting some of their slips slide. Accept that the playing field may not be level, but don’t succumb. Use big-brand tactics as a model to compete. Focus on the big picture for your organization, not just a few on-page factors. Leverage multiple channels, and tap into sources like social media to create brand awareness. SEO comes naturally from actively improving the health and overall message of your brand. Be agile—risk is the differentiator that smaller businesses have over the big fish. Fail early and adapt, or succeed and prove that you’re ahead of the curve. As Meyers says, big brands “don’t put all of their eggs in the Google basket.” Get active on new and unproven channels, and stay on top of social, tech and business trends. On a related note: recently Google rolled out Brand Activate solutions to help brand marketers measure the reach and impact of brand campaigns, and how ads affect consumer behavior. 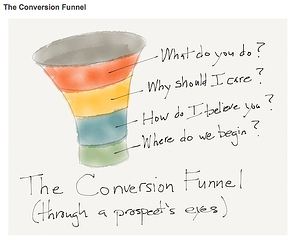 View the conversion funnel through the eyes of consumers, and aim to answer their questions during the buying process. Landing pages are at the epicenter of content marketing, performance marketing and technical wizardry. Modern marketers should make A/B testing a best practice and part of their DNA, not just a capability. Conversion rate and brand impact can be complimentary, and should both be pushed to achieve great results. Differentiate your landing pages. Says Brinker, "don’t just be branded, be a brand." Do you still ask, “why?” Robert Rose (@Robert_Rose) helps content marketers channel their inner child, and suggests that asking “why” can lead to a larger story. Rose’s technique is simple: ask “why?” five times to get to the root of a problem, and your real message. Content marketers can use this process to form solid mission statements for content ideas, as questioning messaging, meaning and value can help you get to the true purpose of an idea. Additionally, you’ll learn to support the ideas that have solid answers to the “whys,” and abandon those that don’t. Despite its standing as the "black hole" of social networks, setting up a Google+ page is a step in the right direction for businesses, particularly as Google search pulls Plus data intro results. Businesses should not only keep their Google+ pages updated, but also take advantage of all of the social network’s features for maximum SEO benefits. Kissmetrics’ (@kissmetrics) Marketer’s Guide to Google+ provides helpful, step-by-step instructions on how to set up, build out and optimize a Google+ company page. One of the guide’s most important tips is how to verify your business’ name, which links your account and website to prove validity for fans who want to find your real page over impostor accounts. Google continues to clean house in hopes of simplifying the user experience, as it closes or combines another round of products. These include: API changes, removal of Google Talk app and One Pass payment platform, Picasa enhancements, and more. Facebook also looks to simplify by consolidating its Preferred Developer Consultant and Marketing API programs into the Preferred Marketing Developer Program. MarketingProfs (@marketingprofs) reports that B2B companies are ramping up data-driven marketing, with 80% spending more time and resources on critical metrics in 2012. In addition, it reports that consumers’ most trusted sources are word-of-mouth recommendations and user-generated content over email, social media or advertising. Michele Linn (@michelelinn) recaps Content Marketing Institute’s 2012 Digital Content Marketing Survey, with stats showing that 70% of marketers plan to outsource at least one form of content within the next 12 months, which is most often video content.